Conley Equipment Company is proud to carry East Penn Manufacturing’s Unigy I series of telecommunication batteries. Their Deka Unigy I – 12AVR75 offers more power for less space. This means you can power your telecommunications systems with a reliable battery while still being concerned about the footprint of your system. At Conley Equipment Company, we knew the only way to get an edge over our competition was to offer high-quality products and services. In order to become the battery supplier our clients know they can rely on, we’ve partnered with East Penn Manufacturing. As their largest value added reseller, we can give our customers the lowest rates and the best possible customer support. At Conley Equipment Company we strive to be a one-stop shop when it comes to your battery supply needs. That’s why we’ve selected East Penn’s Unigy I series of telecommunication batteries because of the value they create for our customers. Not only do we use them in the systems we design and engineer, but we also offer the batteries themselves if you need new or replacement ones. 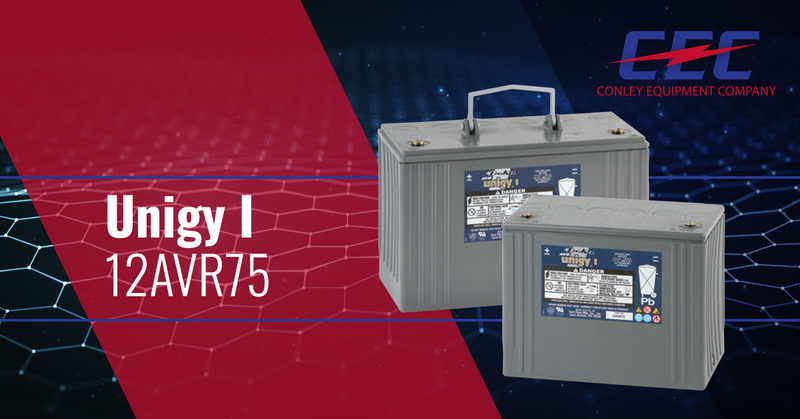 If you’re looking for a reliable telecommunication battery with a reseller who actually adds value, then order your East Penn Deka Unigy I – 12AVR75 from Conley Equipment Company today. We offer unparalleled customer service and expertise for all of your telecommunication battery products and services needs. We wouldn’t have such glowing reviews from AT&T, CenturyLink, Comcast, and more if we didn’t put our clients first and offer them the best possible solutions. Fill out the form to your right and get a free quote today. If you’re looking for the official cut sheet for the East Penn Unigy I – 12AVR75 battery, you can find it on our Product Literature page.